Why settle in terms of taste when you can enjoy the best of both worlds? 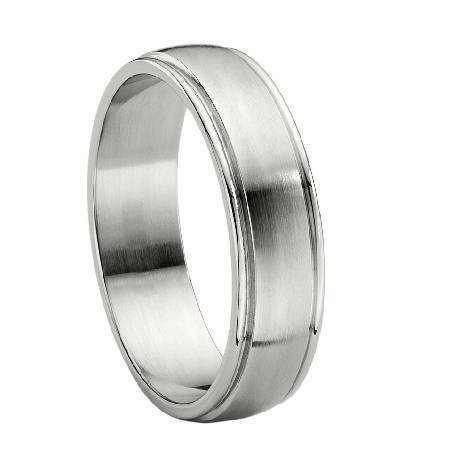 Our men’s titanium brushed-finish wedding band is the perfect solution for any modern groom. This ring is traditional in design yet modern in detail. Titanium is quickly growing as a popular alternative to palladium, platinum, and white gold. For an excellent price, you can enjoy the same silvery hue and the highest strength-to-weight ratio of any transition metal. Titanium does not corrode, dent, or discolor over time. Best of all, it is biocompatible and nickel-free, making it safe to wear even with skin sensitivities. A brushed finish is very similar to a satin finish, except that a brushed finish features a fine texture made with a wire brush. 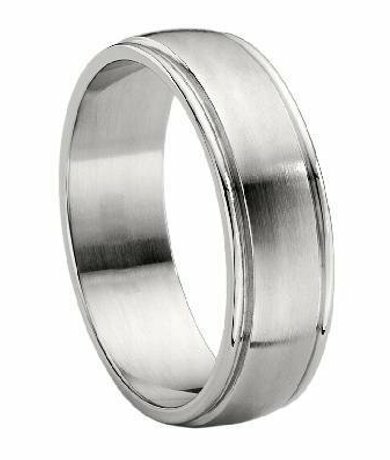 Brushed wedding rings are very popular amongst men who work with their hands because scratches do not show up easily and these rings are not very shiny. We accentuated the men's titanium brushed-finish wedding band with highly polished banded boundaries to provide a subtle sense of sophistication and sheen. Each men’s titanium brushed-finish wedding band we offer features a traditional design. Traditional wedding rings fit differently than comfort-fit rings or heavy domed rings. We recommend that you visit a professional jeweler near you to have your ring finger sized for accuracy. Once you determine that a traditional band is right for you, complete your order with confidence. JustMensRings.com is honored to be a part of your wedding day and your journey. Please let us know if you have any questions or concerns, and a member of our team will gladly help you in your selection. Very pleased with our purchase. We were a little nervous buying from overseas, but it arrived very fast and was exactly as described. Thank you! Very nice looking ring, looks better in person. Exactly what I wanted and at an unbelievable price. Macy's had the same ring for over $200.00! I Love this ring. My husband cried when I gave it to him. thank You. We are both very happy.